Knowing how to efficiently present instructions and information to residents, staffs and medical professionals can increase quality of care, profitability, professional development and communications. In this critically important career-field, knowing as much as possible about those who serve and how they learn (in this ever-changing landscape) is vital. Gains in operational efficiencies and resource allocations. More efficient professional development and training sessions. Increased collaboration, communications and group dynamics. Using leading edge technology (unlike static subjective surveys and personality tests) APTUS removes the potential for human bias through objective and consistent controls. APTUS couples advancements in Behavioral Science, Leadership Development and Educational Technology to provide discovery of how one Defines, Processes and Executes instructions and information across various contextual environments. We measure learning while learning is occurring. 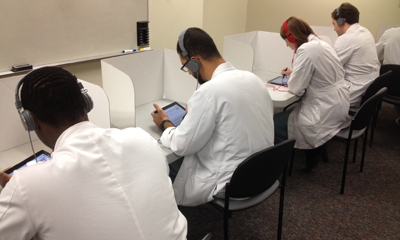 APTUS uses tablet technology to administer ten, interactive video game-like exercises that reveal how a medical professional learns. The continual professional development and growth of medical personnel plays a strategic role in the financial and organizational strength of any healthcare organization. Reduce training costs (time and other resources). Increase returns on investment for training and development. Develop personnel by offering development opportunities. Improve on boarding of new hires and residents. Aligning workforce development and performance to corporate objectives.